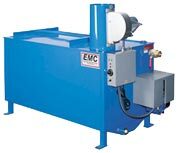 EMC Packaged waste water evaporator systems for industrial applications processing air compressor condensate, die cast solutions, floor scrubber water, grinding & machine coolants, machinery wash & rinse water, mop water, paint booth waste water, parts washer water, pressure washer water, rinse water, vibratory waste solutions, wash water, wire drawing coolant, and other water-based wastes that have some oil or grease in it. We supply 2 electric evaporator models (6 and 10 gallon per hour evaporation rates) and 3 natural gas or propane units (12, 18, or 40 gallons per hour evaporation rates). All systems come as turn key packaged systems made of 316L stainless steel or carbon steel holding tanks, fully insulated, auto fill system for fully automatic operation (includes 70 gpm self-priming centrifugal pump, high level shutdown sensor, manual pump switch, and diverter valve for reversing the pump for removing liquid concentrate), automatic safety shutoffs for low level control and high temperature shutdown, simple on/off operation, variable weir oil skimmer, power exhaust fan, US made industry standard components & controls plus one year warranty on parts & workmanship. TANK HEIGHT 30" 36" 36" 36" 54"
CLEANOUT ACCESS 19" x 22½" 17" x 29" 17" x 29" 29" x 40" 29" x 40"
WEIGHT 420 Lbs. 450 Lbs. 550 Lbs. 800 Lbs. 1200 Lbs. 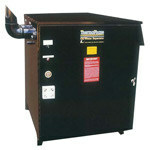 ThermaPhase Evaporators are designed specifically to process compressor condensate. The ThremaPhase units are thermostatically controlled, electrically heated (480/3/60 Volts) evaporation units. The condensate water leaves the unit as atmospheric steam and the lubricant is left in the system to be drained and discarded.